mauraweb!» archive » wait, what? It was June, and then the kid’s school ended, and then we took a few trips, and now it’s nearly the end of July. Woah. The trips were to Germany and Vermont and New Hampshire and all were different and fun. I have to go back to work tomorrow so I should go to sleep, but I’m compelled to share a few holiday snaps. 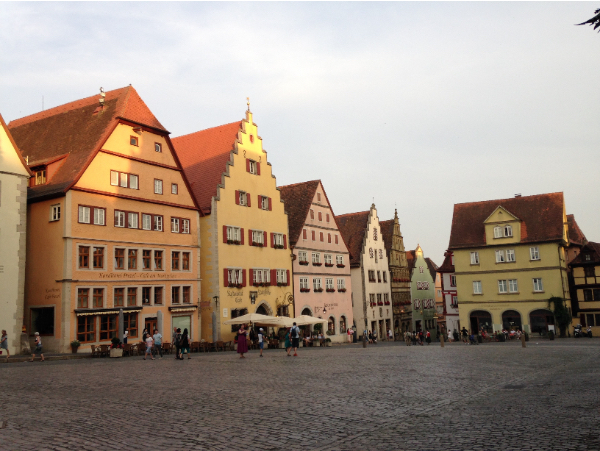 We went to the part of Germany that was very castley. 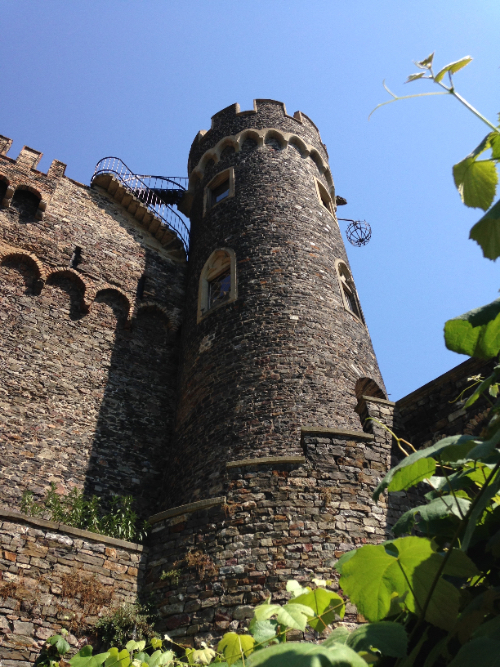 The castles were amazing — this is one on the banks of the Rhine that we climbed up to. It was very very high, and I chickened out of going up those stairs to the very top. I like to think that the hanging cage is for the heads of their enemies, but that’s probably not true (this was a country residence more than a fortification). The parts that weren’t castley that we visited were like a Disney village. For serious, it was just like stepping into the set for Pinocchio. Wild. Ice cream! The Germans are apparently mad for ice cream and the party I traveled with indulged more than daily. To be fair, it was in the mid to high 90s F the whole time we were there, and like any good Old World nation the Germans eschew air conditioning (luckily the beer was also cold and plentiful). 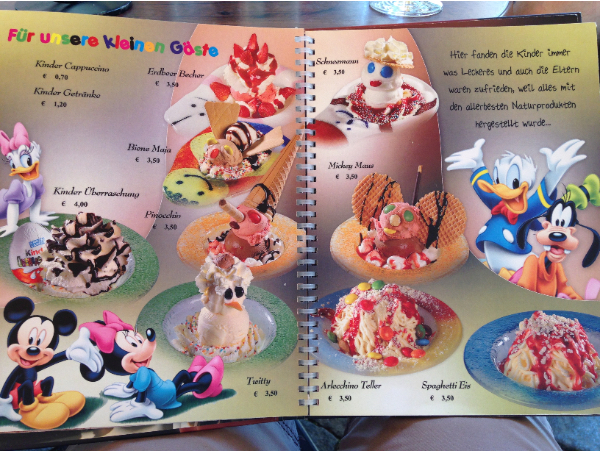 This is the kiddie menu from one of the many eiscafes that we visited. Super creepy. 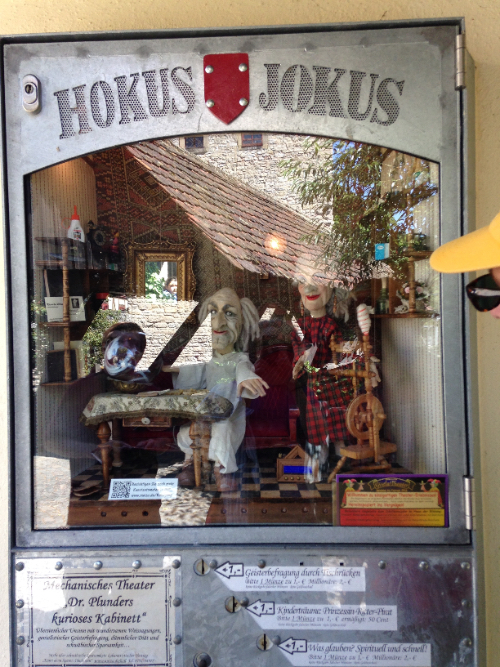 And speaking of creepy, one of the towns we visited had these marionette machines that you put a euro in and the puppets would act (and sing!) a story. It was super weird — we don’t know much German so we could only guess at most of the story. Total horror movie stuff, though. After Germany we were home for 12 days, then once the jet lag wore off we headed up to New England for family visiting. First stop, Vermont, where there was lots of nature of the animal sort: my dad now has 3 dogs 4 cats and 8 chickens (!). Plus the undomesticated animals: frogs, froglets, newts, and crayfish in the pond. I swear they were tadpoles with little leg buds on Monday and full-fledged froglets with 4 limbs + a tail by Friday. Zoology, man. 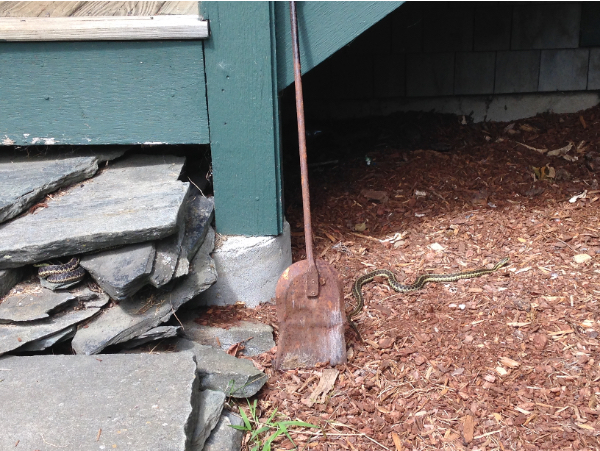 There’s also a family of 3 garter snakes living under my dad’s front steps. We caught 2 of them sunbathing. Next was New Hampshire for more fun with the other side of the family. There was a pool, and there was swimming, because like the Germans, the New Hampshireans don’t have air conditioning. 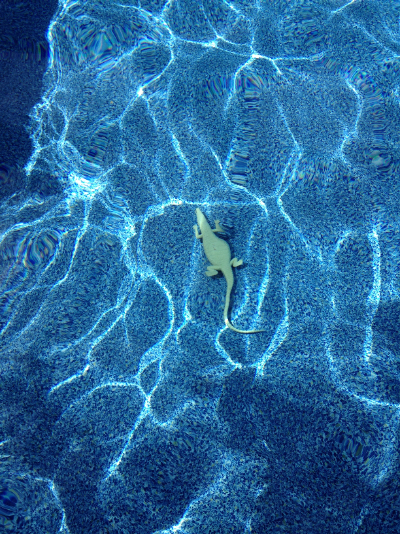 The plastic alligator had a little too much to drink and pulled a SoCal, Less Than Zero-style sinking to the bottom of the pool. And now we’re home (sigh). And it’s going to be hot this week (double sigh). But it’s nice to be back. Boy, the cats missed us.